The ranks given above are after the five men received two rank promotions after death by special attack. In August 1980, the Battleship Yamato Monument was unveiled on the grounds of Naramoto Jinja. In October 1981, five concrete replicas of 250-kg bombs carried by the Zero fighters of Yukio Seki and the other four members of the Kamikaze Special Attack Corps Shikishima Squadron were placed around the original Seki Monument. The new monument is referred to as the Kamikaze Special Attack Corps Shikishima Squadron Five War Heroes Monument. Admission to the museum is free. Hours are from 10 a.m. to 4 p.m. daily, but usually visitors need to ring the bell to gain admittance to the locked museum due to the few people who stop by. A very informative 60-page booklet in Japanese entitled Shikishima-tai go gunshin no shirube (Guide to Shikishima Squadron five war heroes) is available for 500 yen. This booklet contains detail biographical information and photographs of each of the five Shikishima Squadron members in addition to articles about the museum and monuments at Naramoto Jinja. There is no information in English at Naramoto Jinja. Despite the name, the Kamikaze Special Attack Museum does not provide an overview of the operations of Japan's Kamikaze Special Attack Corps in the latter part of the Pacific War from October 1944 to August 1945. 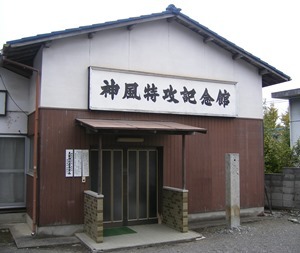 Instead, the museum serves primarily as a memorial dedicated to Yukio Seki and the other four members of the Shikishima Squadron. The museum's main exhibition case shown below has a large photo of Yukio Seki in the center and two photos on either side near the top of the other members of the Shikishima Squadron. From left to right below are the photos of Hajime Nagamine, Iwao Nakano, Yukio Seki, Nobuo Tani, and Shigeo Ōguro. The two photos to the right of Shigeo Ōguro were taken when the Shikishima Squadron was formed at Mabalacat Airfield in the Philippines. 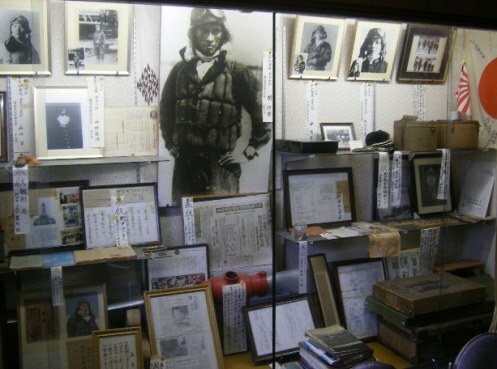 The exhibition case contains other photographs, newspaper articles, information on family members and others who visited Naramoto Jinja, various artifacts of the five squadron members from their time in the Navy, books, and other items.